Do your kids tend to forget everything over the summer? I can’t really blame them, I tend to do the same thing. 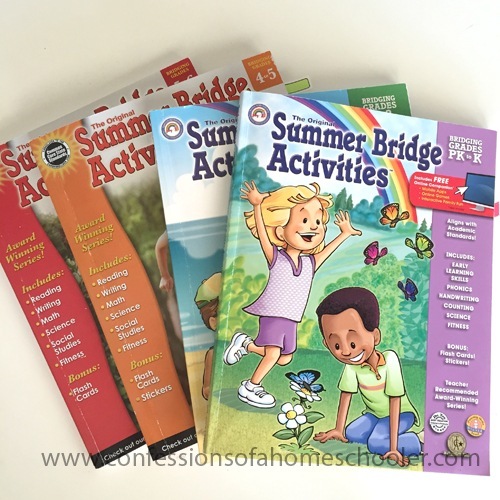 That’s why I like to pull out our Carson-Dellosa Summer Bridge activity books. They’re great for covering a range of skills for each grade level. And they’re also relatively fun, colorful, and have a variety of activities to work on. I like to pull them out randomly over our summer break just to keep skills fresh. And honestly they’re also a great way to alleviate a little summer boredom as well. And no, Carson-Dellosa didn’t pay me to say all that! We’ve used these books over our summer break for awhile now, and love them! Well I love them. I can’t say the kids LOVE doing school over the summer. But I think even they like a little something to do here and there. We also try to go on a lot of outings, field trips, and things like that. Just to get out of the house, have a little fun, and hopefully learn a little in the process! But shhhh! Don’t tell my kids that I have ulterior motives. They think they’re just having fun! And of course we take lots of trips to the library to get what we refer to as “fun reading” books over the summer too! Other then that, I don’t do too much in the way of formal education. We like to take a good long break, relax, and enjoy the warm weather! Now excuse me while I go grab some tea an sit on my front porch. My boys love these! We also like Evan-Moor Daily Summer Activities, which is very similar.